Dr Michael Wu has been performing Endovenous Ablation Therapy in Melbourne for over 15 years. 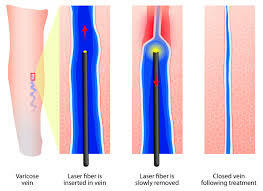 Endovenous Ablation Therapy also known as radiofrequency or laser ablation, is an treatment performed in the doctor’s office as a minimally invasive method for treating large varicose veins. Endovenous Ablation Therapy uses radiofrequency or laser energy to seal and close varicose veins in the legs. Varicose veins develop as a result of small valves inside the veins not working properly. When the patient is healthy the one-way valves in veins maintain flow towards the heart against the forces of gravity. When the valves do not perform their function, venous insufficiency leads to pooling of blood in the legs causing varicose veins. Is Endovenous Ablation Therapy Safe? Endovenous Ablation Therapy is a very effective, safe and non-invasive treatment for large varicose veins. Endovenous Ablation Therapy reduces the need for general anaesthesia, fewer incisions and less patient downtime for recovery. Endovenous Ablation Therapy has an overall success rate greater than 97% and the results are comparable to those of traditional surgery in the short term and the long term. How is Endovenous Ablation Therapy Performed? During the procedure, local anaesthesia is used to numb the treatment area. A thin catheter is then inserted into the vein through a needle puncture site. The catheter delivers energy to the vein wall, causing it to heat, collapse and seal. Once the vein is closed, other healthy veins take over and empty blood from the legs. As normal return flow is re-established in the body, symptoms improve noticeably over time. What is the risk of recurrence of varicose veins after endovenous ablation treatment? What is the recovery time after endovenous laser treatment? Varicose veins are the result of a progressive disease, and while we can treat the problematic veins now, it is up to the individual patient, their genetics, and their lifestyle which dictate whether other varicosities will develop over time. Patients are encouraged to start walking immediately after the procedure, but they should avoid any strenuous exercises involving the legs (such as weight training) for two to three weeks, to enable adequate time for healing and for the treated veins to remain closed. There is bruising and mild discomfort in the treated leg for two to four weeks.